Orange County, Fla. – The Orange County Utilities Solid Waste Division reminds unincorporated Orange County residential customers that garbage, recycling and yard waste will not be collected on Christmas Day, Monday, December 25. All curbside collection services have been moved forward by one day during the holiday week for unincorporated Orange County customers. 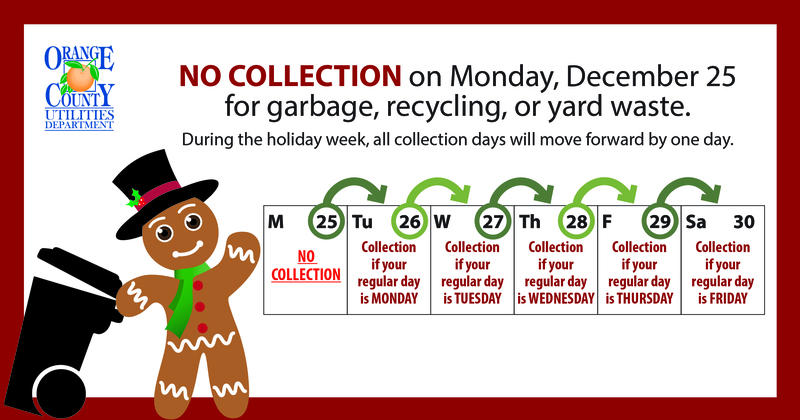 If Monday is a customer’s normal collection day, set out roll carts and yard waste by 6 a.m. on Tuesday, December 26. As part of Orange County’s program, the only collection holidays are Thanksgiving and Christmas. However, crews work through Saturday during those two holiday weeks. If Friday is a customer’s normal collection day, set out roll carts and yard waste by 6 a.m. on Saturday, December 30. Regular service schedule will return the following week. Monday, January 1, 2018, is not a collection holiday and curbside service will occur on that day. Customers are encouraged to recycle holiday items like flattened cardboard and cards/envelopes in the blue lid roll carts. Other items like most wrapping paper, ribbons/bows and stringy light sets, belong in the green lid garbage roll carts. When in doubt, leave it out or check www.ocfl.net/recycles. The Orange County Utilities Solid Waste Hotline at 407-836-6601 and email Solid.Waste@ocfl.net will resume business on Tuesday, December 26. Customers can visit online at www.ocfl.net/GreenClean.